Calculated “inflation” in Europe disappointed again in March, as for the second month in a row the HICP rate was below zero. There had been some hope after the German version turned just slightly positive that it would herald a different sign for the rest of Europe. Instead, inflation rates in other places were mostly the same; Spain stuck at -1% for the second month; France at -0.1% February and March; and Italy dropping slightly to balance out Germany, -0.3% in March from -0.2% the month prior. In reality, there isn’t the slightest bit of difference in any of these numbers as they all suggest the same, continuous monetary mistake. Monetary policy is supposed to be the dominant setting for inflation through expectations of (as always) money printing via various balance sheet expansion schemes. Whatever you think the effort, that is the intent and it is stamped on every press release accompanying the initial announcement of all the various programs. The ECB has employed a number of them in constant fashion over the years and has come up short every single time. 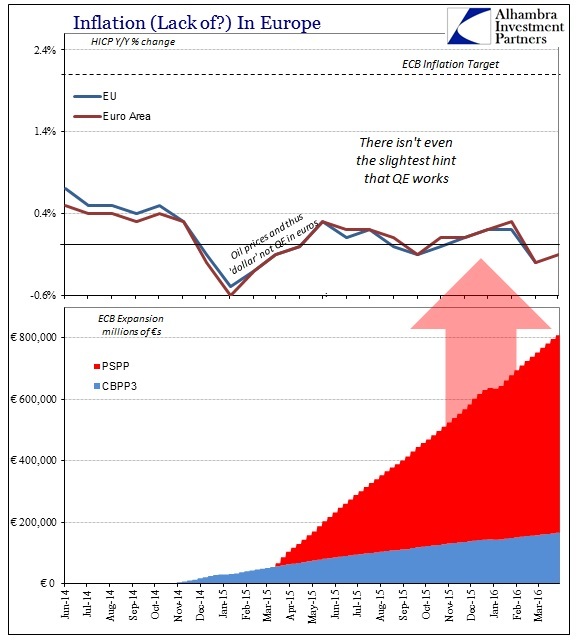 The latest, the combined PSPP (QE) and CBPP3 (third time at covered bonds), has totaled more than €800 billion to date; and inflation is no closer 2%, instead still stuck around zero. But where monetary policy leaves absolutely no imprint, “something” else does and it is easy to observe in almost every part of the inflation breakdowns. 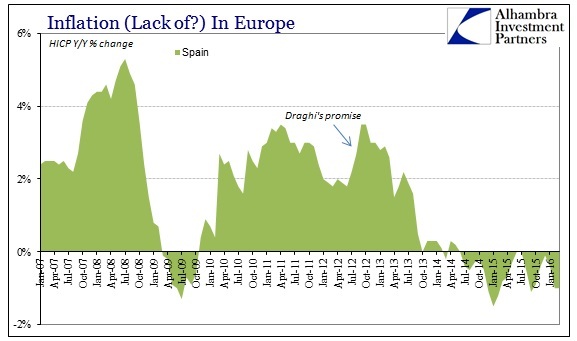 Starting with Spain, a country that is supposed to be among the shining examples of Draghi’s 2012 promise to “do what it takes”, its calculated HICP rate only moved higher in the first two months after the unofficial proclamation. Then, just like its government bond yields, inflation conspicuously dropped and has never recovered. Lower interest rates have not provided the intended monetary lift. Over in Germany, the Continent’s powerhouse, the inflation trajectory is far more simple and easy. 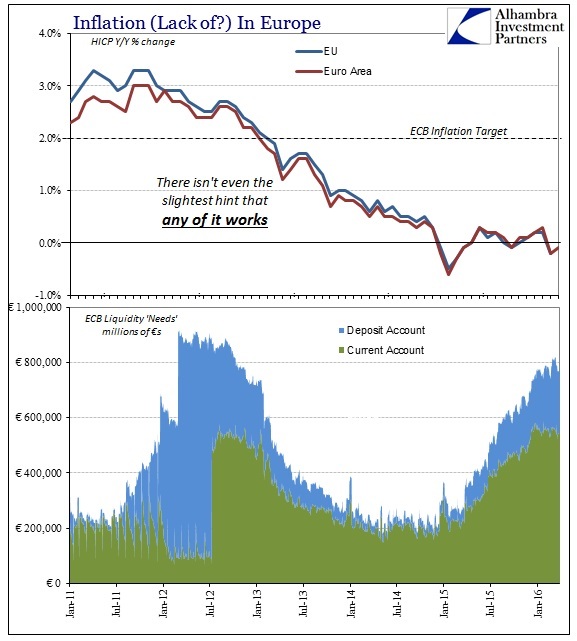 The HICP rate holds like the rest of Europe to nothing of monetary policies, from the LTRO’s and SMP’s to now NIRP, QE and whatever other madness the ECB finds fit to fail at. 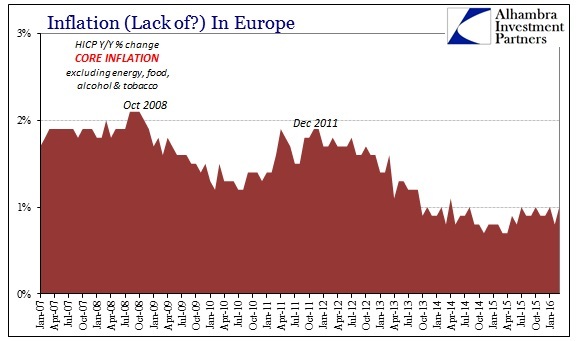 The starting point of that disinflationary slide, however, suggests that European inflation is not without monetary causation – it just doesn’t originate with any central bank. 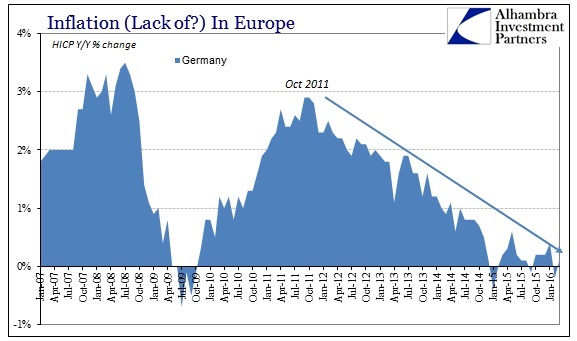 The peak in German inflation, as so many other places around the world, and not just Europe, was September and October 2011. Those months need no introduction or explanation, as they feature prominently in banking history, meaning the world’s true monetary agency. We find the same in Europe’s “core” inflation rates, which strip out volatile food, vices (so called) and of course oil and energy. There was a lot of concern when Eurostat calculated the “core” rate for Europe as just +0.7% in February (since revised to +0.8%), which likely unleashed the torrent of additional QE promises and intrigues last month. The ECB panicked over what that suggested of “second order” inflation, or what orthodox economics conceives of its true method and target. In other words, commodity prices can have effects, but it is consumer price behavior in the more stable economy that is relevant to what monetary policy aims to achieve. The update for March in “core” HICP seems to have calmed some fears, as it was figured at +1.0% and thus at least not moving lower. I don’t think you can make that determination since stagnant against €800 billion in supposed “money printing” is still the same failure to make any impact. “Core” inflation, as overall HICP, has done nothing according to policy and everything in the same direction as overall inflation only with a smaller beta. This non-volatile measure has been 1% or less for 23 consecutive months dating back to May 2014 and the onset of NIRP. The last time it was close to 2% was, unsurprisingly, December 2011 and the start of the LTRO’s. Even here we find banking events rather than monetary policy events (the banking flare up clearly “won” against the LTRO’s) as the relevant inflection. That is even the case going further back; the last time core HICP was steady around or above 2% was, also unsurprisingly, October 2008. It is plainly obvious in these distinctions and the timing; economic circumstances as they relate to calculated inflation have nothing to do with monetary policy and its bank reserves which are not money, and everything to do with decisive banking events and what counts in the wholesale world as money. Central banks intend that monetary policy drives economic inflation, and that does seem to be the case except that the monetary part has not really involved central banks. The stimulant part of the recipe has been removed from the “stimulus”, a condition that central bankers (and the media that still blindly defers to them) seem yet unaware but markets are increasingly taking note. This relationship has been true for far longer than just this “cycle.” The difference pre-2007 was that everything ran on faith, that the threat of central banks being asked to prove their printing press was enough. After 2008, the threat was no longer so decisive, forcing central banks to actually prove themselves. They have, repeatedly, starting with the events of 2008, only in the opposite; that there is no money in monetary policy and hasn’t been for so long that nobody quite knows what to do about it except to rinse and repeat. Shampoo central banking.